The Bernstein Companies and its joint venture partner, Boston Properties, marked a significant milestone earlier as they broke ground on the future Marriott International headquarters in downtown Bethesda, Maryland. J.W. Marriott Jr., chairman of the board of Marriott International, opened the ceremony by welcoming Maryland governor Larry Hogan, Montgomery County executive Isiah Leggett and other public and private dignitaries to celebrate the first phase of construction of the company’s new headquarters. “Montgomery County has been our home for more than 60 years and we take immense pride in this community and in the strong relationships we’ve developed here,” said Marriott. Marriott International chief executive, Arne Sorenson, pushed Marriott’s move from its current suburban location to a walkable, transit-oriented environment. “We are thrilled to be recommitting ourselves to Maryland and investing in Bethesda,” said Sorenson. “This location places Marriott in the heart of a vigorous, educated, and diverse community. Sorenson said the headquarters office building will be a cutting-edge, sustainable, workplace offering state-of-the-art technology, modern amenities, and easy access to a range of transportation options, including the Bethesda Metro Station less than two blocks away. With more than 785,000 square feet of office space, the building is designed to support approximately 3,500 staff. The campus will also offer Marriott associates a childcare centre, a fitness centre, and a cafeteria. In addition to the headquarters building, the location will also be home to a new Marriott Hotel, a 244-key, full-service property with more than 8,000 square feet of meeting and ballroom space. The hotel will also offer guests and the public access to a coffee shop, a roof-top bar and lounge and a contemporary neighbourhood restaurant serving breakfast, lunch and dinner with the option of outdoor dining on a pedestrian plaza. “For over 60 years, Marriott has shown such loyalty and commitment to the future of our state – infusing more than $430 million into our state economy,” said Hogan. “Today we are seeing even more proof, and a shining example, of the incredible progress we are making. The Bernstein Companies and Boston Properties own the land and will jointly develop and own the Marriott International headquarters office building while The Bernstein Companies will build and own the adjacent hotel. Marriott will manage both the office building and the hotel. In December 2017, the developers received formal approval of the sketch, preliminary and site plans from the Montgomery County Planning Board. Demolition will begin this month and construction is scheduled to begin in July. 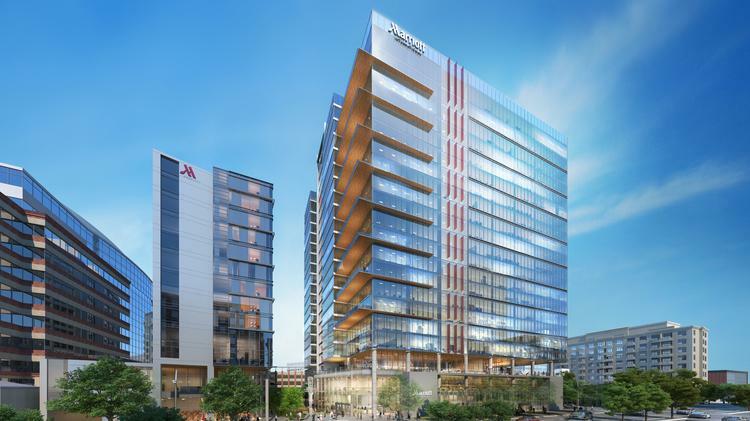 In early 2022, the Marriott Hotel will open and Marriott International associates will move into their new headquarters office building by mid-2022. As of 2017, Marriott International supported more than 10,000 jobs throughout Maryland, and approximately 6,100 in Montgomery County alone, making the company one of the county’s largest private employers.